On Sunday, I called my MOM to wish her A Happy Mother's Day. I figured she was Out Doing Something, so I tried her cell phone first. "OH HI THE DAILY RANDI THANK YOU FOR CALLING I CAN'T TALK RIGHT NOW I AM IN THE MIDDLE OF BLOOMIES IN BOCA WITH MY FRIEND LINDA! WHY DON’T YOU EVER CALL? WHAT? I AM ON THE PHONE!!! WHAT DID YOU SAY? OHHHHHH! LINDA SAYS HI HAVE YOU EVER MET LINDA I CAN'T REMEMBER OR YES YOU DID WHEN SHE WAS IN LOS ANGELES AT THE SAME TIME AS ME AND HER SON WAS GOING TO SET YOU UP WITH SOMEBODY WHAT EVER HAPPENED WITH THAT? LINDA!! LINDA!!!! WASN'T YOUR SON GOING TO SET UP MY DAUGHTER WITH SOMEONE? YOUR SON!! NO, THE OTHER ONE! I KNOW HE IS MARRIED. HE HAD A FRIEND OH NEVER MIND YOU KNOW LINDA'S SON JUST HAD A BABY AND THAT MAKES LINDA A GRANDMOTHER! ALL OF MY FRIENDS HAVE GRANDCHILDREN EXCEPT FOR ME OH WHERE DID I GO WRONG YOU WILL NEVER HAVE CHILDREN BECAUSE YOU ARE WAY TOO SELFISH AND IMMATURE AND YOUR EASILY ANNOYED SISTER AGREES! YOU SHOULD CALL YOUR SISTER IT IS NONE OF MY BUSINESS BUT THE REASON YOU TWO ARE NOT TALKING IS ALL YOUR FAULT I DON'T WANT TO GET INVOLVED OH WHAT A NICE PURSE! IS THIS COACH???!! EXCUSE ME!! EXCUSE ME! DO YOU WORK HERE? I HAVE TO GO!!!!! I JUST FOUND A NICE PURSE!!!!!" Well, anyway, It's The Thought That Counts. You mom has ADHD doesn't she? 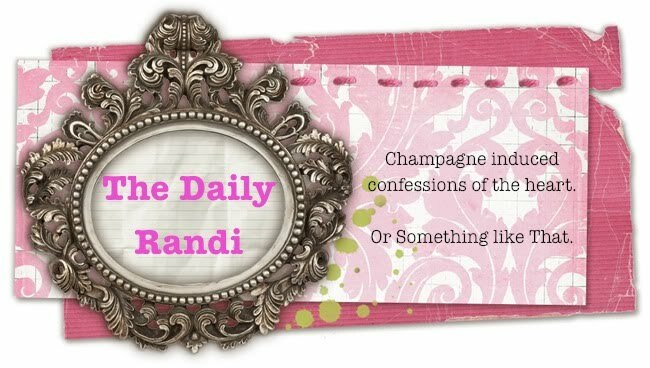 Admit it Randi. Sounds nice but woooo might need an off switch at times. I like Amy's idea of modeling a character after her. That's really funny. Kind of reminds me of the woman who played Bridget Jones' mother in the movie.